Hot off the press, and a great classic basic for $19.99. (14.95 Euro). Generally, I’ve found that V-neck cardigans are better all-rounders because they layer particularly well and add a neat, elongating touch to your long lean line. Perfect over sleeveless dresses, knitted tops and silky blouses. 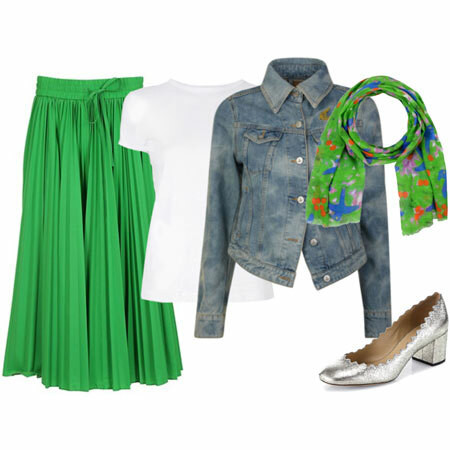 I tend to like the style best when the sleeves are scrunched because it adds a nice textural dimension to your ensemble. They’re made of a soft, non-itchy cotton-spandex mix and available in plenty of colours. The shades across the continents will differ slightly though. You’ll find purple and teal hues amongst the assortment in the US, and cobalt and coral shades in Europe. Remember that H&M sizing is small so size up if you prefer a roomier fit. H&M’s quality is often hit or miss, which we have come to expect from all budget retailers. But I was pretty impressed with the drape and substantial weight of these cardigans when compared to Old Navy’s Spring cardigan, which is longer but thin and flimsy. H&M wins this round. I bought a plum colored version of this cardi at H&M for fall, and I have been impressed with its quality. I’m not usually an H&M shopper. I bought that sweater and a pair of $5 plastic bangles that generate a ridiculous number of compliments. I would love to get this in Cobalt but I cannot figure the site out. When oh when is H&M going to get an online store?!? The closest ones are an hour away from me (nothing for miles and miles, and then two different shops practically next door to each other). I’ll have to remember to try and stop the next time I am over there. Thanks for the heads up. Thank goodness there is an H&M just mere blocks from my house! I guess I take it for granted that I have three H&M’s very close by. Wish we all had H&M’s close by. Half the time they look fabulous, but H&M also goes through stages of looking like a dog’s breakfast. So true to their name – they are a “hit or miss”. They are still continually my retail choice of uber cheap fashion though because they’re super trendy and the fit works for my body type. I have a few H&M treasures that are still going strong! You need Uniqlo! No, really, you need Uniqlo!! The quality of the fabric and the cut and finish is just soooo good compared to H&M. After all, they perfected it on the uber-finicky Japanese, who are legendary for liking things Just. So. 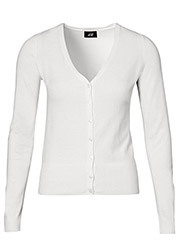 And at £15 (USD$20 or so) for a great layering basic long-line cardigan the price is the same… not forgetting the brilliant lightweight but masterfully shape-holding tees at 2 for £12 ($16)… Angie, have you shopped there? Would love to know what you think? Uniqlo did not pass Angie’s quality control test. Sad. That dress was SO cute! My H&M pieces are all fantabulous. Their quality is miles better than Forever 21 or comparable stores. We have more H&M’s in NYC than I can even remember, often within a few blocks of each other, and ALL of them are always full. I have found that the collections vary widely from one store to another. The one on 51st street is my favorite, but 34th street never impresses me. Sometimes they carry the same stuff, but when they don’t, it’s like two different stores. I wish this came in black as I need to replace my black Gap cardigan and I’m reluctant to spend lots of money on such a boring but necessary basic. I’m also more interested in new look cardigans, especially a red boyfriend cardi, which I haven’t had much success finding at the right price point. Maya, this cardigan *does* come in black – and thanks for answering aussieinlondon. I have one Uniqlo item that did not pass quality control. I am not rushing back to the store. On Uniqlo quality, I have two cashmere sweaters from them. One has held up great, and the other on pretty bad. So I guess it is quite open. H&M destroys unsold clothing so that it can’t be used by those in need. I have been so unimpressed by the H&Ms near me – one of them is located in a very good outlet mall, and the other in a high-end shopping centre, but both of them have extremely overpriced items for their quality, and it seems like everything is $40 and up for nothing. Even at the SF centre (the third location), I had a frustrating time in, it truly has been miss, miss, miss for me. I want to like H&M, but it hasn’t fit my quality standards at all. Angie, I can’t tell you how impressed I am that you are posting about so many affordable pieces lately. You even put them in the store. Thank you, thank you! Like Maya, I love H&M. I have had a lot of luck with their sales recently. They constantly have a huge section of clothes on sale for $5, $10, $15 and $20. It is absolutely amazing! This winter only I bought 3 awesome dresses, 1 pair of black skinny jeans and a boyfriend cardi. I would have bought more if I didn’t restrain myself Additionally my all time favorite cowlneck sweaters (2 of them in black and soft pink), green wool jacket, corduroy skirt and gray button-down shirt comes from H&M. I may come across as an H&M addict but I think it is a really great store for affordable and trendy stuff. H&M similarly gets my vote for cheap go-tos, and I’m glad to see that their cardigan selection this spring is looking good. I have a skirt and button-down from them that are now almost five years old and still look good to wear. I’m not as fond of their woollens, but their cotton sweaters have always last well (and I just lost my favorite one on the ferry); here’s hoping that they have a shade that doesn’t drive me crazy. I’m in desperate need of new cardis for spring, so I’ll be schlepping down to H&M at some point to check these out! Thanks Angie. All stores do that. H&M is just a scapegoat. Do you regularly see new, unworn clothes hanging around in thrift stores and going to the homeless? Of course not. The only way you can avoid enabling it is to buy used clothing. This is an unfortunate reality, but you can’t single out one store for it. I have that exact cardigan in black! It totally rocks! I love H&M too, and living in Norway, I’m able to shop online. I also have items that have lasted for years and don’t look worn at all, among other things a gery merino wool v-neck knit top. However I don’t find the sizing particularly small – I often have to choose size S tops instead of my regular size M! I love that blue/purple colour. If I can’t get it in the UK anyone in the US want to do a swap if I buy the coral? I think that with any of the high street shops like H&M, Zara, Mango, Gap and Uniqlo you very much pay for what you get. Some things last well and others don’t. I have some lovely clothes from all of these stores and I have bought others that haven’t lasted well. I wish we had an H&M. I’ve been eyeing this v-neck cardi, but it’s longer. I looooove H&M, and since I´m able to shop online, I literally shop there every week. You have to watch quality, but I only buy the good stuff and I have H&M items that last for many seasons. I regularly road test new looks with an affordable H&M piece, and when it passes the trend test, I´ll stock up with pricier items. H&M is pure fashion fun: you see something, like it, buy it – no worrying about my budget!! I also really appreciate you clearly explaining concepts and the whys of style. Pushed up sleeves adding “textural dimension” = brilliant! I’d never thought about pushing up my sleeves in those terms before. Thanks, Angie, for all you do on this blog. Thanks for the post. I was actually checking out the site last week looking for options for a lightweight layering option as I am going on a cruise in 2 weeks and want something that layers with everything. Lo and behold you post exactly what I need. I definitely wanted a more budget friendly option, so this is perfect, I will be heading to H&M and Old Navy to see which I prefer. Thanks Angie! Thanks for the tip, Angie! 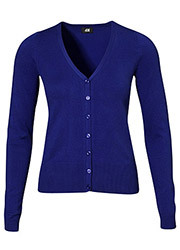 I picked this cardigan (in bluish purple) today. 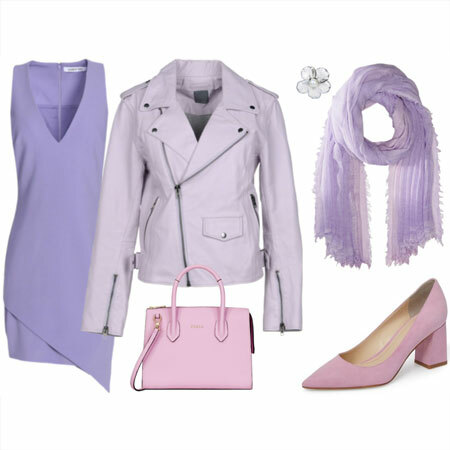 I’ve been looking to augment my spring cardigan collection, and this works perfectly. It is a great spring basic, and the quality is very good for cotton knitwear. I wish US stores had the yummy cobalt color that is on the picture. I think that I got the same color as Marianne- it’s a light heathered bluish purple. Almost a Forget Me Not or Periwinkle color. The store that I was in had black, teal, two coral shades (one lighter and heathered, one brighter), a darker purple, and I think a few other colors. I ended up wearing this for part of the day and I really liked it paired with my yellow top. The sleeves are long on me, but that just goes without saying because it’s always the case on sweaters. I’m glad that I was able to find such a pretty shade. DD and I both thought that this shade won hands down (for me) on the color test. They also has a ruched sleeve cardi that I liked just as much, but which didn’t come in as many colors.